Columbus Crew Stadium wasn't quite this empty in the snow earlier tonight as they hosted Real Salt Lake in the first leg of their CONCACAF Champions League quarterfinal, but it was close. A few fans endured a sloppy preseason nil-nil draw in the snow, and the fans were the losers. The Crew couldn't score despite a man advantage for almost the entire second half, after Tony Beltran was ejected for a second yellow card in the 53rd minute. In fact, the game ended 10 against 9 when Emilio Renteria and Nat Borchers got the rare "double ejection" for fighting when the referee wasn't looking (personally I think Borchers was responsible for the incident, but maybe that's because Renteria was one of the only players making anything happen on offense). 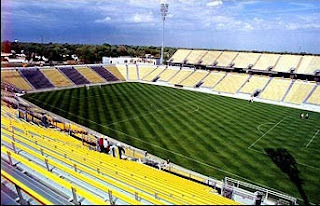 The brightest spot for the Crew in their yellow jerseys was Peruvian Andres Mendoza, who set up Colombian Emilio Renteria for Galavision's "juega del partido" (play of the game) in the 20th minute, but Real Salt Lake goalkeeper Nick Rimando earned Man of the Match honors for saving the shot and everything else Columbus sent his way. In the second half, following the double ejection, Robbie Rogers forced saves from Rimando on free kicks in the 76th and 80th minutes. 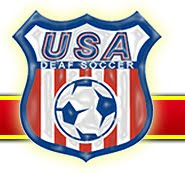 The Crew's emergency goalkeeper, Ray Burse, who was signed about six hours before kickoff, had zero saves and didn't really ever have to touch the ball. Former Ohio State goalkeeper Burse was released by FC Dallas last season after 5 years in MLS and returned home to Columbus, so he happened to be in town when Columbus needed a goalkeeper earlier today. Tony Beltran, Nat Borchers, and Emilio Renteria will be suspended for the second leg of the quarterfinal at Salt Lake City's Rio Tinto Stadium on Tuesday, March 1. In Mexico City, Javier Orozco picked up right where he left off as the all-time leading goal scorer in CONCACAF Champions League history, with his winning goal in the 58th minute leading Cruz Azul to a 2-0 victory over Santos Laguna at Estadio Azul. Orozco blocked an attempted clearance of a cross into the goal. Christian Gimenez of Argentina scored the second goal ten minutes later, chipping the ball over Santos Laguna goalkeeper Oswaldo Sanchez. Gimenez was also a threat on free kicks throughout the match. Santos Laguna attacked the goal early, forcing four saves from Cruz Azul goalkeeper Jesus Corona in the first 15 minutes before Cruz Azul took over for the remaining 75 minutes. Christian Gimenez was named Man of the Match. The two teams will meet again Tuesday, March 1, at Estadio Nuevo Corona in Torreon, where Santos Laguna is in the midst of a three-game home winless streak.